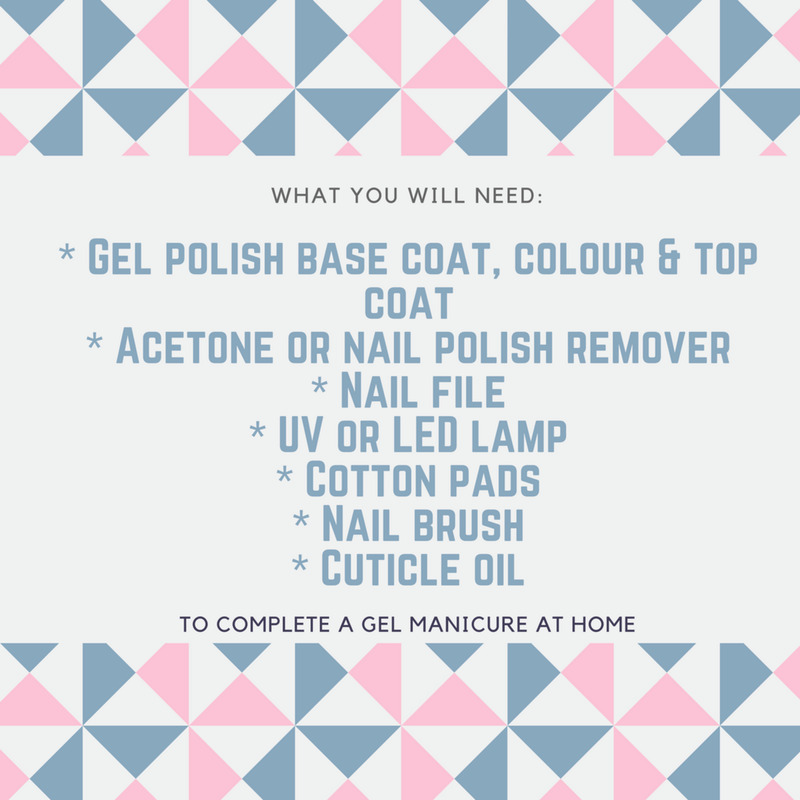 What you will need to complete a gel manicure at home. Step 1: Sanitise & Prep! Firstly, always wash your hands. 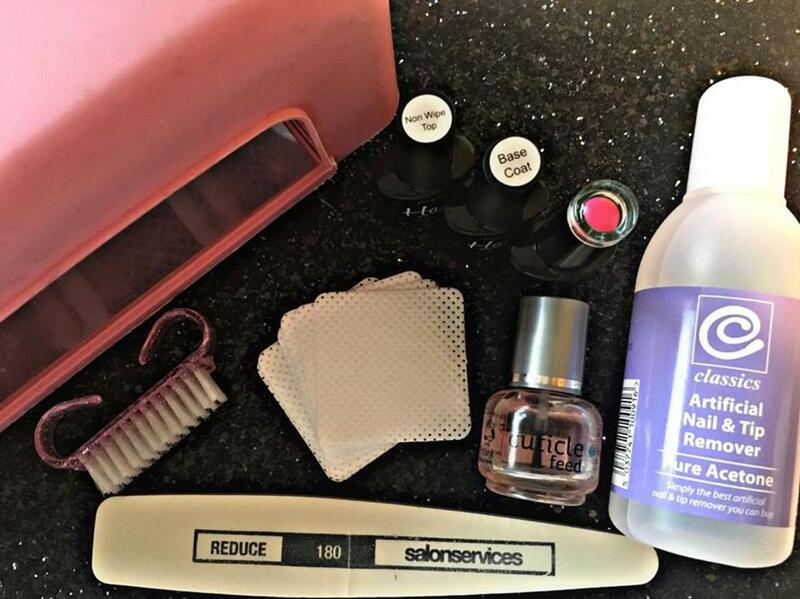 Then, pour some acetone or nail polish remover onto a cotton pad and wipe over your nails. This helps to remove any oils on your nails that will prevent the gel from adhering, and it will prevent the gel from peeling away! Step 2: Shape, Shape, Shape! 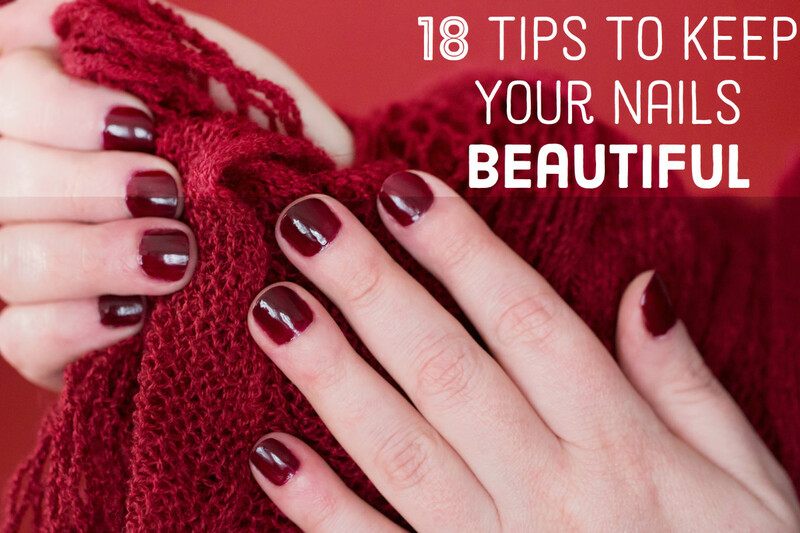 File your nails so they're all the same shape & length. Lightly buff over your nail & brush away the dust. Note: Be very careful when filing over your nail as over filing can cause pain!! Just for good measure wipe again with acetone or nail polish remover on a cotton pad. Step 3: All about that Base! Make sure you have NO dust on your nails before you apply the base coat as any dust will show up as lumps in your gel polish manicure! Place your brush in the middle of your nail, then with your brush push up towards the cuticle and drag back down towards the tip. Then do each side in the same way, then brush along the tip of your nail to 'cap' it. TIP: Aim for 3 strokes to cover the nail this will give the best even coverage over the nail. Step 4: What's your colour? Your base coat will be tacky this is to help the colour coat stick together so be careful not to touch your nails! 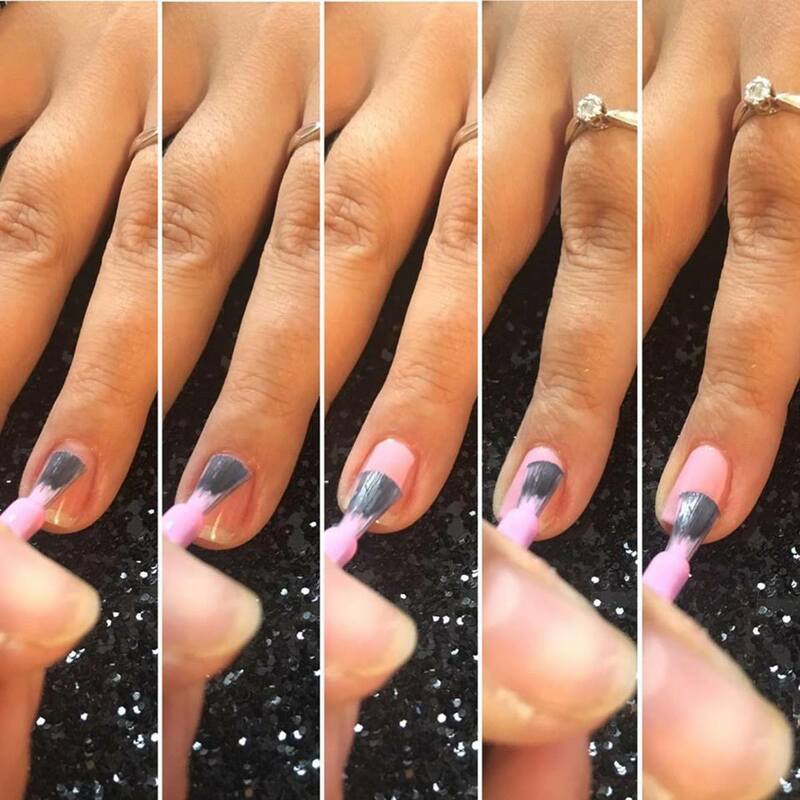 Repeats the same steps as with your base coat: Place your brush in the middle of your nail push up towards the cuticle and drag down to the tip, and the same with each side then cover the tip. Remember, Aim for 3 strokes per nail! Place in your lamp to cure - When you remove from the lamp once cured, if you think another coat is needed go ahead and repeat! Step 5: Top it off! Remember your colour will still be tacky, be careful not to touch your nails! 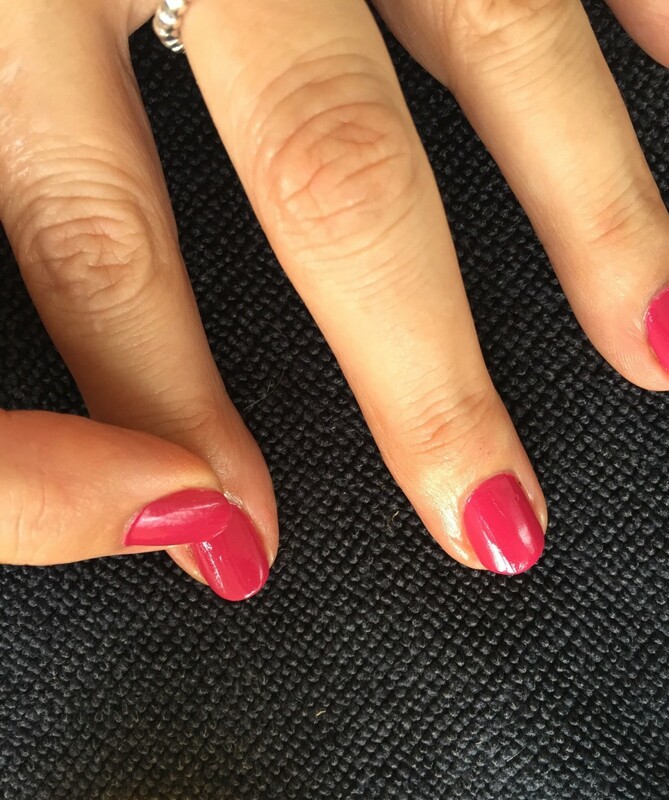 Repeat the same steps as with your base & colour coats: Place your brush in the middle of your nail push up towards the cuticle and drag down to the tip, the on to the sides. Ending with one last caping of the tip. 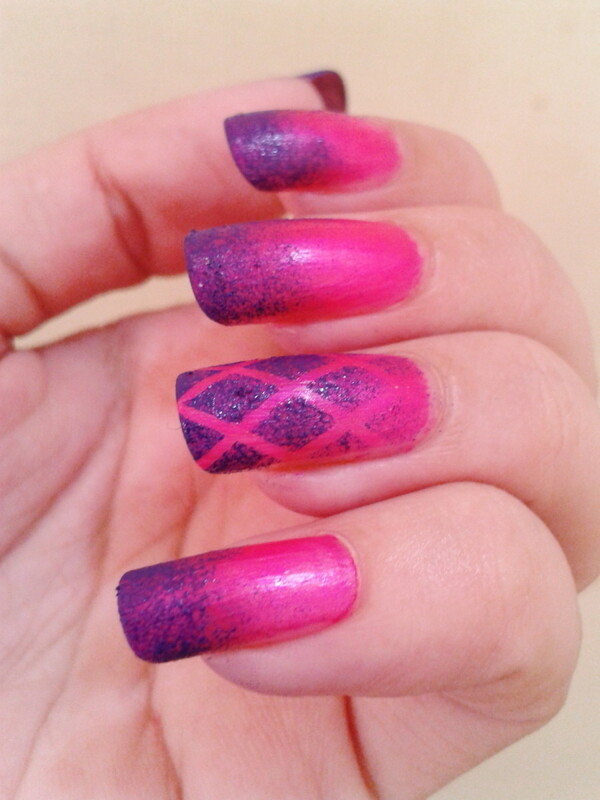 Again, Aim for 3 strokes per nail! Now, depending on your top coat you may have a tacky layer, personally I think Non-Wipe top coats are the best because soon as you come out the lamp your ready to go! However, if your top coat isn't a non wipe you will need to wipe over the tacky layer with a gel residue remover or if your stuck you can use acetone but very light & quick don't leave it on for long otherwise it will start to remove all you hard work! Step 6: Hydrate those nails! After using acetone on your nails it will have dehydrated your nails and removed all the oils - including the good ones, so we need to replace them. You can use any cuticle oil or creams you have, if you don't have any your can use these oils that you may already have lying around your house! Now that's the 6 easy steps to your perfect Gel Polish Manicure at home! 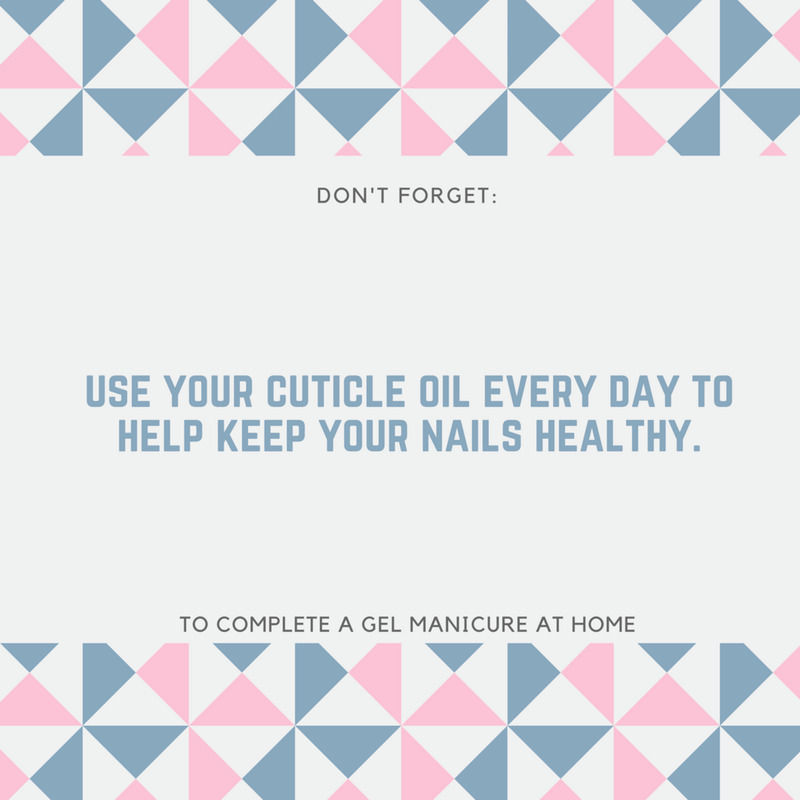 Use your cuticle oil daily for healthy nails, after your gel manicure at home. *Bonus* Step 7! 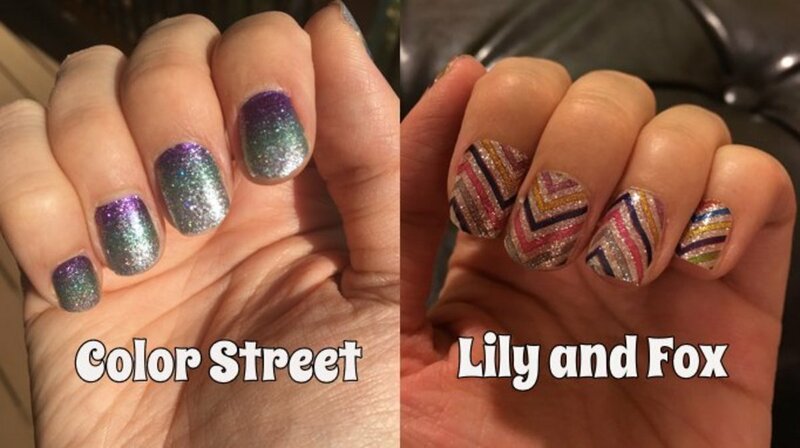 - How about adding some glitter to your Gel Polish Manicure?! If you're going to add glitter to your gel polish I find this the easiest and most sparkly way to do it! You will need a small brush, the one i use is like a concealer brush or tiny foundation brush. Your glitter of choice and i use a small tray to catch excess glitter. Firstly, choose your glitter!! - Whether it is in a bag (like mine) or in a pot this technique for the application of glitter on top of your gel polish will still work. The best time to apply your glitter is when you have applied your second colour coat as your gel polish will still be tacky giving the glitter something to stick to. If you have already applied your topcoat, as long as it has a tacky layer then you can apply glitter on top of that. It wouldn't work for a non-wipe top coat as they don't have the tacky layer. So, place your finger over your dish (if your wanting to catch the excess glitter!). Dip your brush into the glitter and pat onto your nail, keep dipping and patting until your nail is covered. Make sure you are only patting it on at this stage. 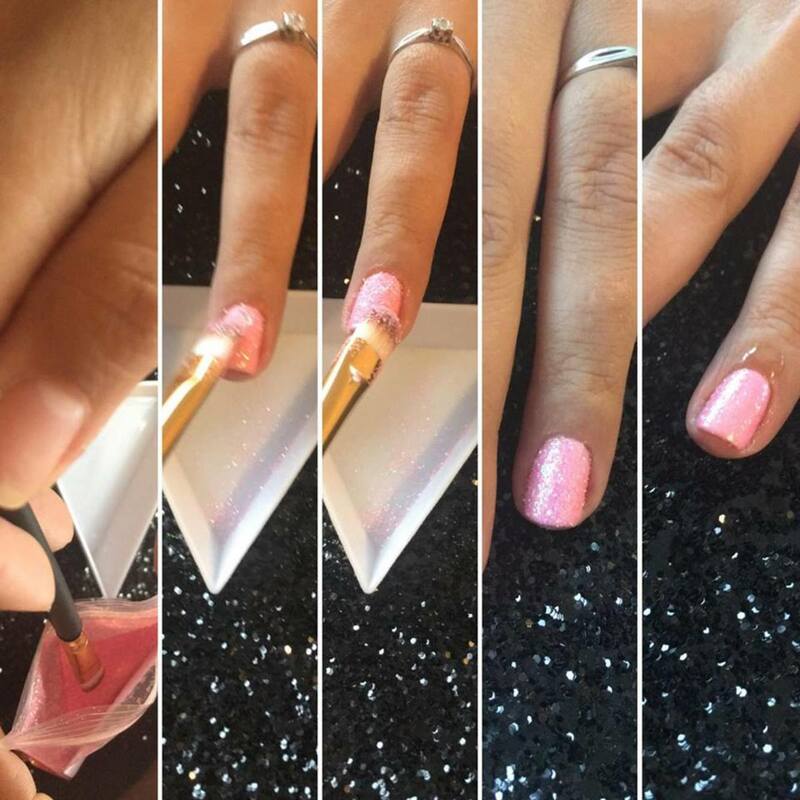 Once your whole nail is covered keep patting with your brush to pack the glitter in as much as you can so you don't have any (or very little) loose glitter. Then very gently brush over the top to remove any loose glitter that hasn't stuck to your gel polish. Put in the lamp to cure, 30 sec in any lamp will be okay for this stage. Then simply adore your gorgeous Glitter Gel Polish Manicure!! 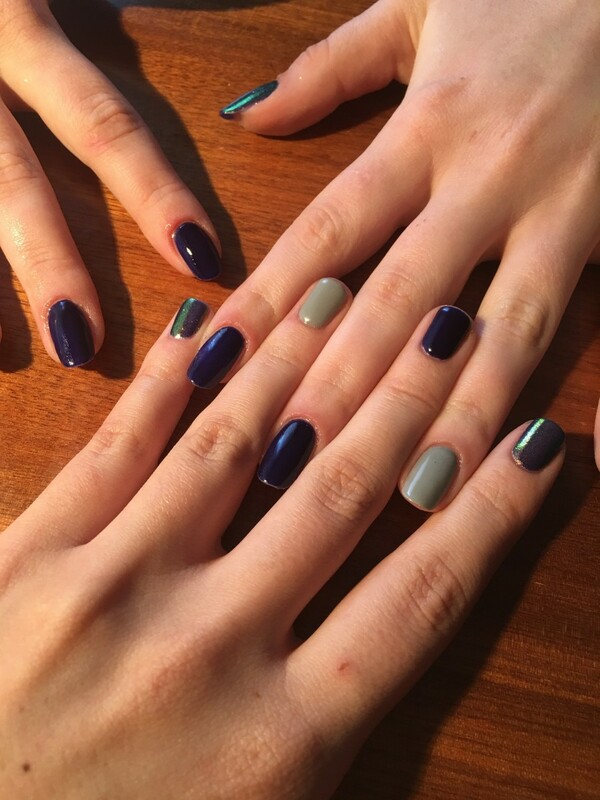 Let me know how you do in the comments & post some photos so I can see all your lovely Gel Polish Manicures! Applying glitter to a gel polish manicure.